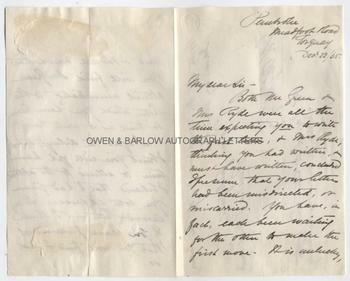 AMELIA EDWARDS autograph letter Signed. Amelia Ann Blanford Edwards. British (English) novelist, journalist, traveller and Egyptologist. ALS. 3pp. Pembroke, Meadfoot Road, Torquay. December 22nd 1865. To E[dmud] K[ell] Blyth. 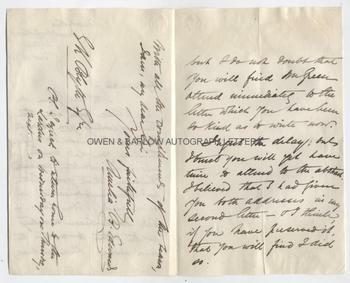 "Both Mrs Green and Mrs Ryde were all the time expecting you to write the first letter, and Mrs Ryde, thinking you had written, and must have written, concluded I presume that your letter had been misdirected, or miscarried. You have, in fact, each been waiting for the other to make the first move. It is unlucky but I do not doubt that you will find Mrs Green attend immediately to the letter which you have been so kind as to write now. I regret the delay, only I trust you will yet have time to attend to the abstract. I believed that I had given you both addresses in my second letter- and I think if you have perused it, that you will find I did so. With all the compliments of the season, I am, my dear Sir, yours" [etc]. "PS. I expect to return home to the [Lardus?] on Wednesday or Thursday next." 8vo. Approx 7 x 4.5 inches. With mounting traces and slight mounting damage to blank verso of last leaf. All else very good or near fine. Amelia Edwards was a widely read 19th century novelist who found immediate success with the publication of her first novel 'My Brother's Wife' (1855). Her reputation was secured by the somewhat steamy novel of bigamy, 'Barbara's History' (1864). Amelia Edwards was also the author of several ghost stories, several of which (such as 'The Phantom Coach') are still read today. She travelled widely and her book 'A Thousand Miles Up The Nile' (1877), illustrated with her own drawings, became a huge best-seller. Her Egyptian travels sparked her interest in the archaeology of the region and she was one of the first to recognise the need to preserve the ancient monuments. Amelia Edwards founded the Egypt Exploration Fund and worked tirelessly for the rest of her life to promote the study of Egyptology and to preserve Egyptian remains and artefacts. Her considerable collection was bequeathed to the British Museum on her death. 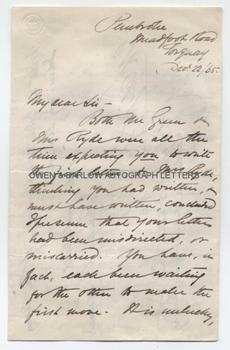 Autograph material of Amelia Edwards is comparatively scarce. Edmund Kell Blyth was a London solicitor and the author of a biography of Dr William Ellis. His sister, Annie, was the mother of the composer, John Ireland. Provenance: From a 19th century album composed by the Blyth family.